An intensive treatment to polish and protect wood and leather. Restores to a rich lustre and satin smoothness. Rub a small amount onto surface and buff to a shine with a soft cloth. Can also be used to soften very dry skin, or as a lip balm. 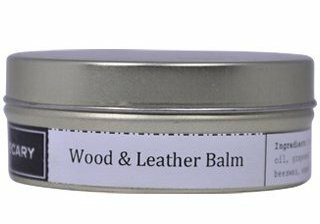 Bring back the lustre of leather and wood using a safe, edible product, deliciously fragranced and therapeutic to breathe. Apply to wood or leather with a soft cloth to clean and buff to a shine. Can also be used as a salad dressing.